Recently I attended Front Trends 2014 in Warsaw. This is an awesome conference which you should (no, definitely have to!) attend in 2015. Besides incredible main programm Front Trends provides a set of Lighting Talks. This year I was a part of it presenting Steroids, a framework and a toolkit for developing HTML5 mobile apps. If you did not have a chance to hear it, this offline text presentation is for you. 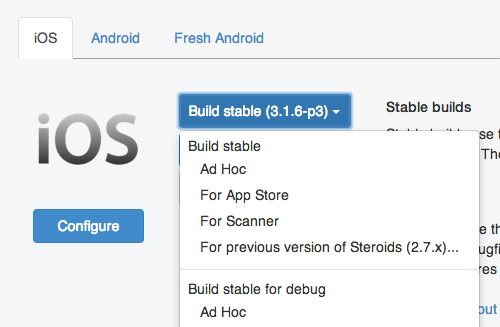 Being an absolute newbie in developing mobile apps I decided to showcase Steroids because it enables me to create pretty native-looking application and smoothly go through the developing and releasing flow in a few minutes. The required version for now is 0.10.25. Follow the Installation and Setup Guide. Your very first start would be creating a project using steroids create command. Then, typing steroids connect --watch in the gotten project folder launches steroids process. The --watch flag as you can guess tells Steroids to watch over the file changes, rebuild the app and push the results to the connected devices. You can connect a physical smartphone to the project. After running steroids connect you get a web page with a QR code opened in your browser. Use AppGyver Scanner to read this QR code, it will bring the application into your phone and keep it connected. Another way to watch the app is to bring it into a desktop simulator. To do this, type simulator in the terminal wich launched steroids connect. You can change the application source files. E.g. edit a text in www/index.html and make sure that the app in the connected device or in the simulator has been changed. To provide more powerful changes you can learn from the examples and tutorials. Run steroids generate command and get the relevant code. You can learn from this code examples, from tutorials and API Docs. Below I demonstrated some of the features which enable to use native UI. Let us start with showing the native tabs. In the config/application.coffee file you can find a commented example of defining a list of tabs with their icons and locations (URLs) they lead to. Place the pages into www directory and keep them empty yet. Do not forget the icons. You can borrow the whole icon folder. After making the change wait for rebuild and check. Next, we can play with notifications. Place these buttons inside the <body> container of the www/notificationExample.html file. Now you can navigate to this page using the tabs and try each type of notification with tapping. Another native element could be a button in the application navigation bar. This will bring the button to the right side of the navigation bar. Tapping on it you can see a notification; one of those you studied recently. The last of native UI examples in this app is showing modal views. And code showModal method to open a view as a modal. The related view is a piece of html, which you should place into app/views/modalExample/show.html. BTW, it has to have an interface element closing the view. To make the process faster, pick up the code from the application repo. With this and other UI features you can build a mobile interface which looks absolutely native for a device where you application runs. Once finished coding (or even in process) you may need to show the application to your friend, client or Mom. You can use the QR code from the beginning of our session which can bring your application to any any device directly from your computer. However this only will work if them both are connected to the same network. If you want to share with someone remotely, deploy your app into the cloud. The steroids deploy command serves for it. As a result you get a page (also with a QR code) which can be scanned with AppGyver Scaner on a phone and thus your pal get the same app from the cloud. All your applications in the cloud can be shared, tuned and built with web interface at cloud.appgyver.com. From there you also push the app into AppStore and GooglePlay. This is easy. 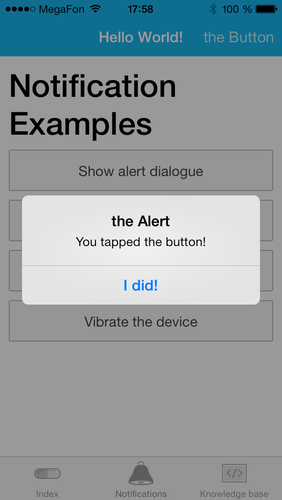 As easy that a newbie can develop an app in a few minutes and show you the how-to.